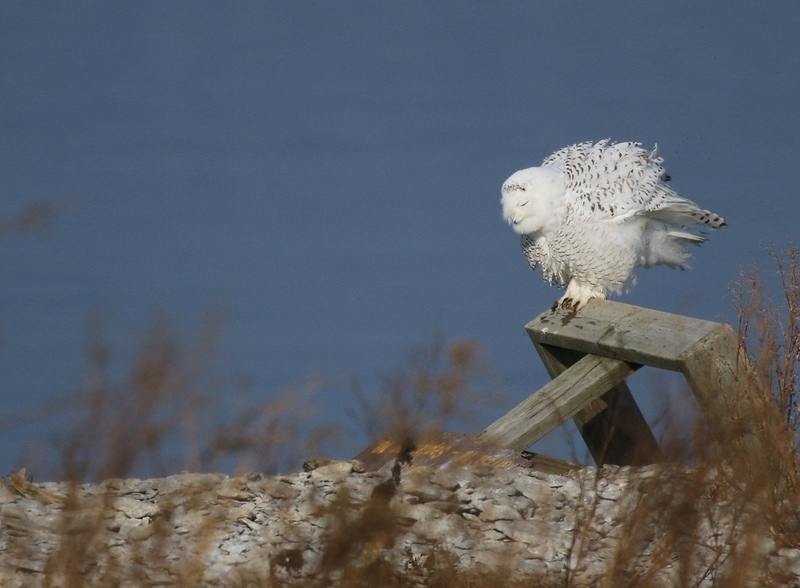 Sunday morning I had an island in Lake Ontario and eight Snowy Owls all to myself. I got down to Presqu’ile Park as the sun was rising and headed down the beach. The day was calm and warm, so I knew the crossing to Gull Island would not be too crazy. The water between Owen Point and Gull Island was still up to my knees, but with little wave action the crossing in chest waders was easy. 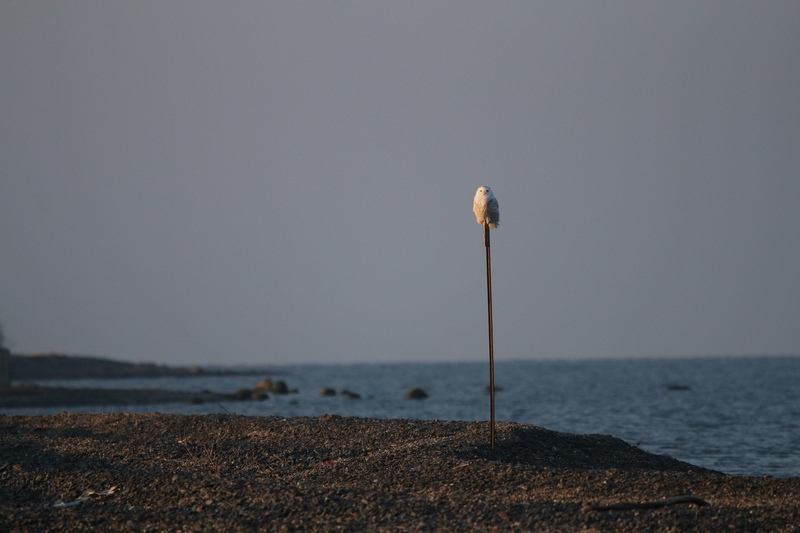 Halfway across the water I could see a lone Snowy Owl perched on a post, lit up by the rising sun. That beautiful bird was only a hint of things to come. 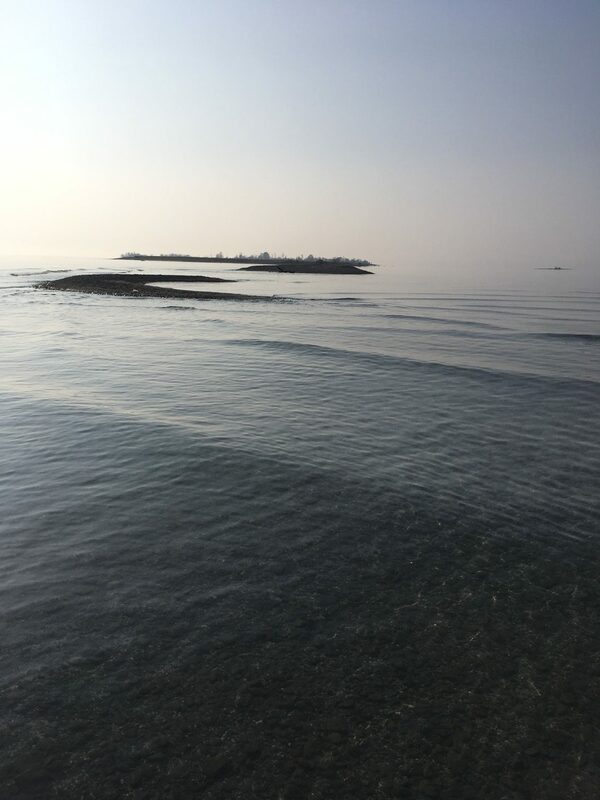 As I walked through the water and drew closer to the island, I noticed two owls flying around on the near shore. 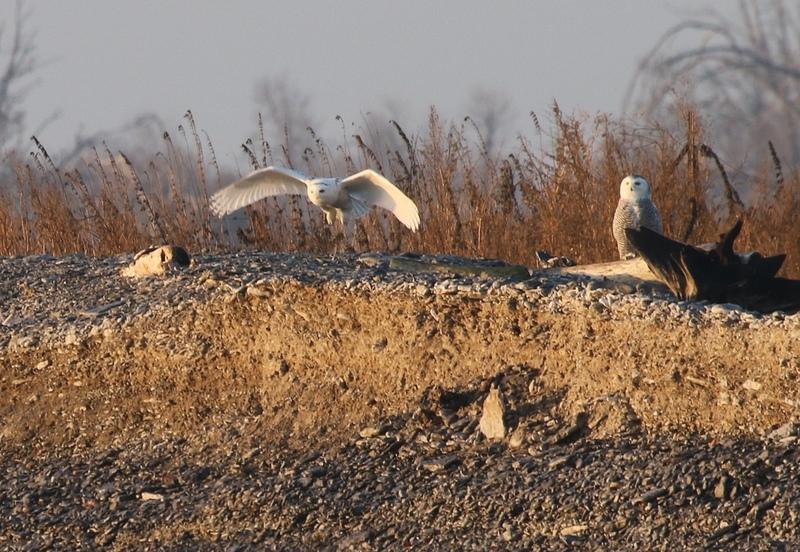 The younger one on the left moved towards the one on the right and made all kinds of bobbing and beak opening movements. 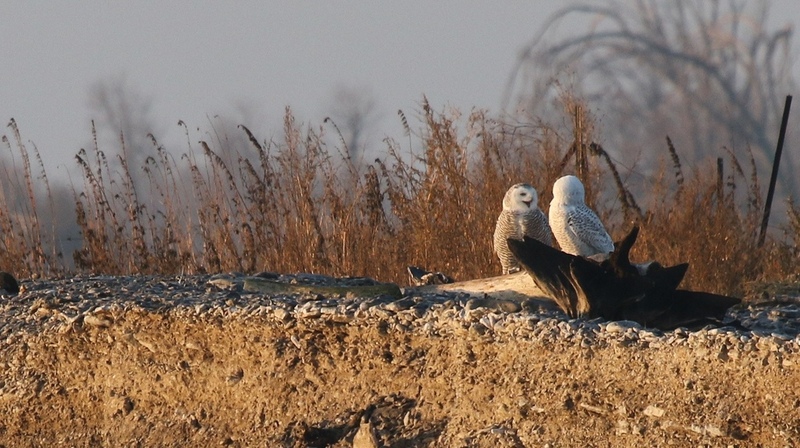 The other owl really wanted little to do with the young one, and flew to a perch nearby. I really think they look like angels when they are landing. 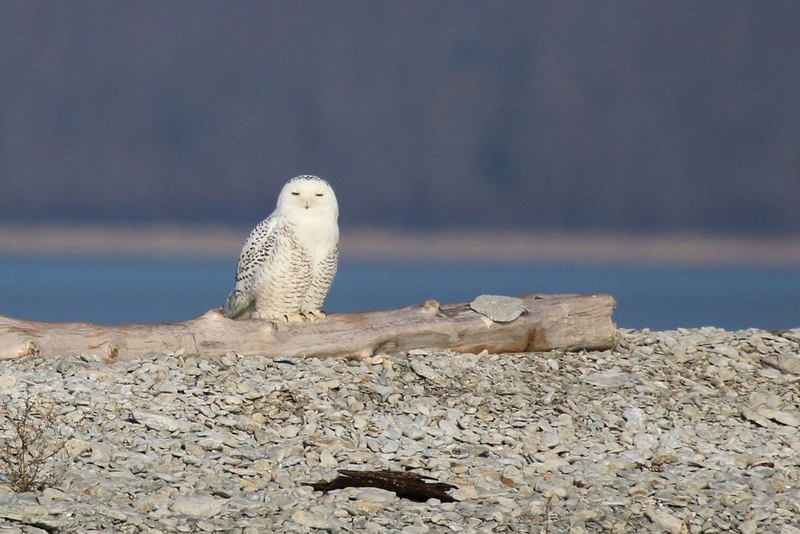 As I finally stepped onto land on the island, I could see 6 Snowy Owls right from where I was standing. 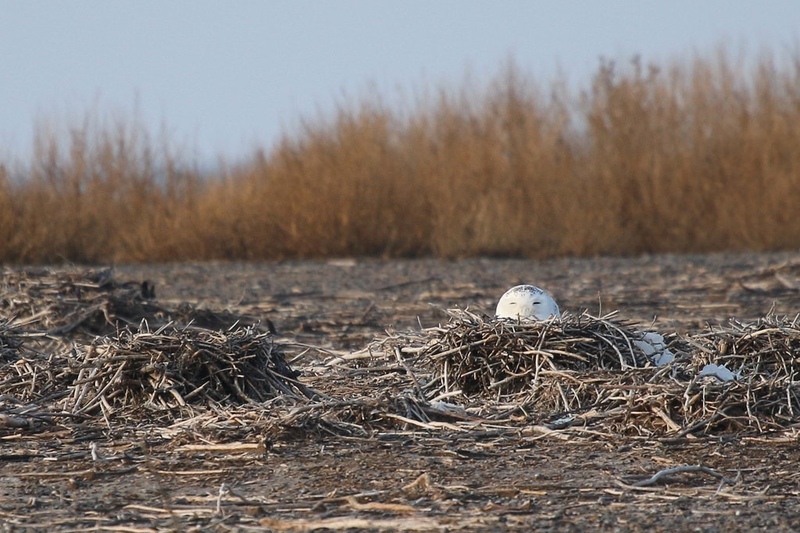 Some were hidden, like this one who was hunkered down in an old Cormorant’s nest. Some were right out in the open, bathing in the morning sun. What a beautiful sight. 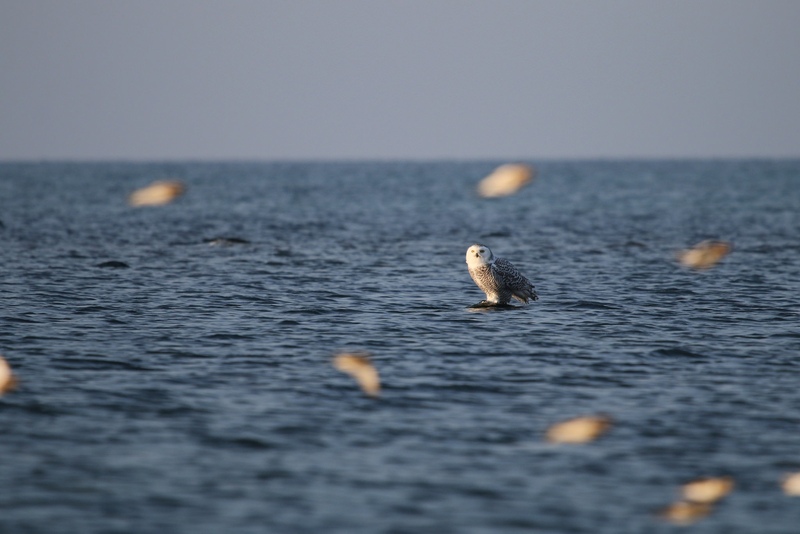 Speaking of bathing, I got to see two different owls taking baths in the calm waters of the lake. 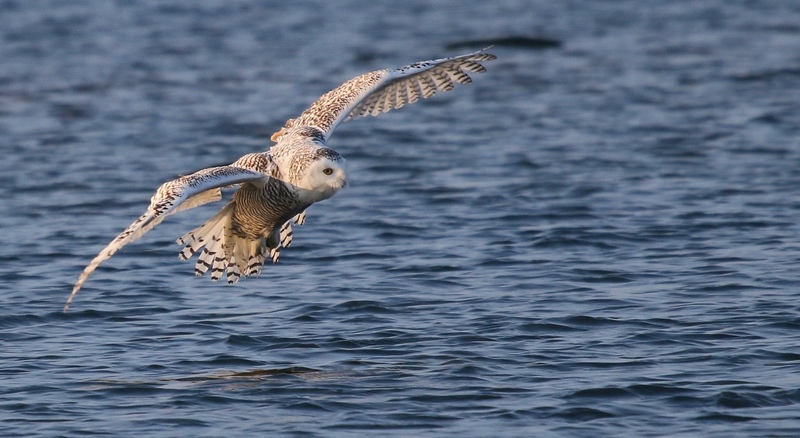 The one above was surrounded by Snow Buntings as it flew and landed in the water. I have never seen this behaviour before! 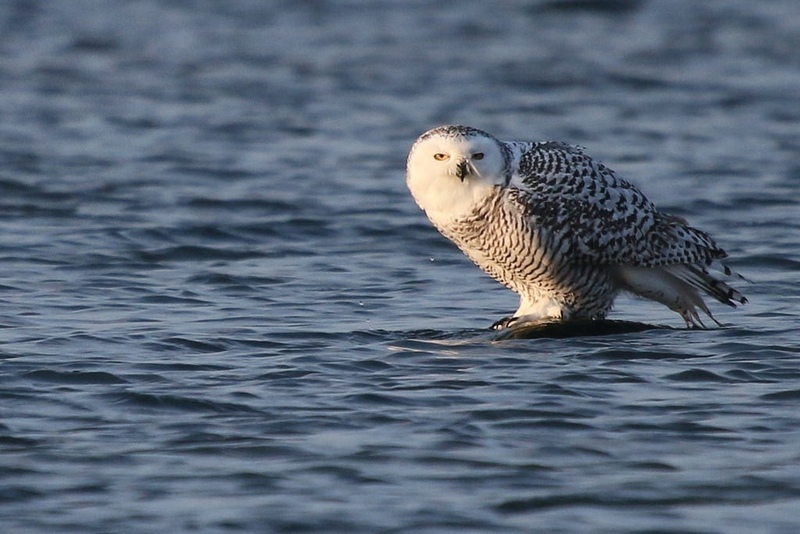 I watched fascinated as the owl dipped and bathed, perched in the shallow water on a small rock. Every once in a while it would look around, the continue with its business. I sat on the shore, as still as I could despite my excitement. 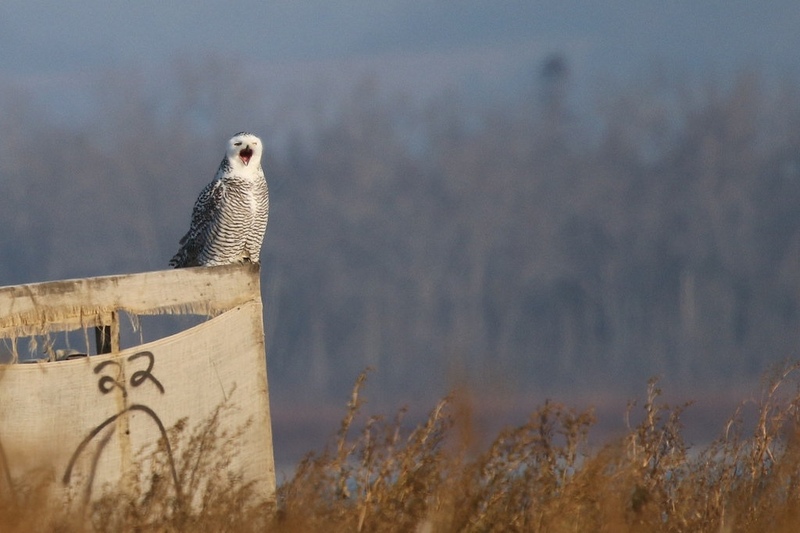 Later that same owl flew up onto one of the duck blinds on the island and began to try to regurgitate a pellet. It looks like it is yelling or singing, but what it’s really doing is trying to make room for the big pellet to come out. 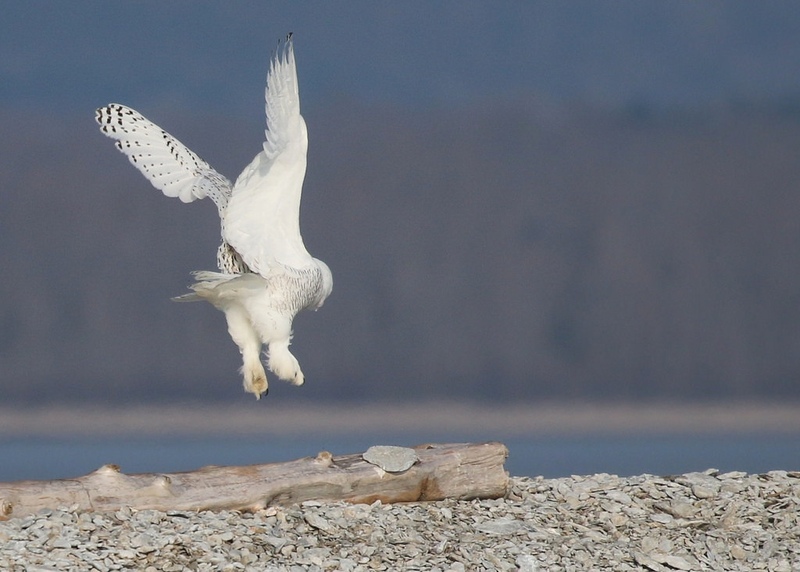 Since owls eat their prey whole, they have to get rid of the bones and fur and other hard parts of what they are eating in the form of a tightly packed pellet. Snowy owl pellets I have found are around 10 cm long and 2 cm wide. Can you see two owls in this tree? I was amazed how many of the owls were hanging out together in pairs. In the past I have almost always seen them by themselves. 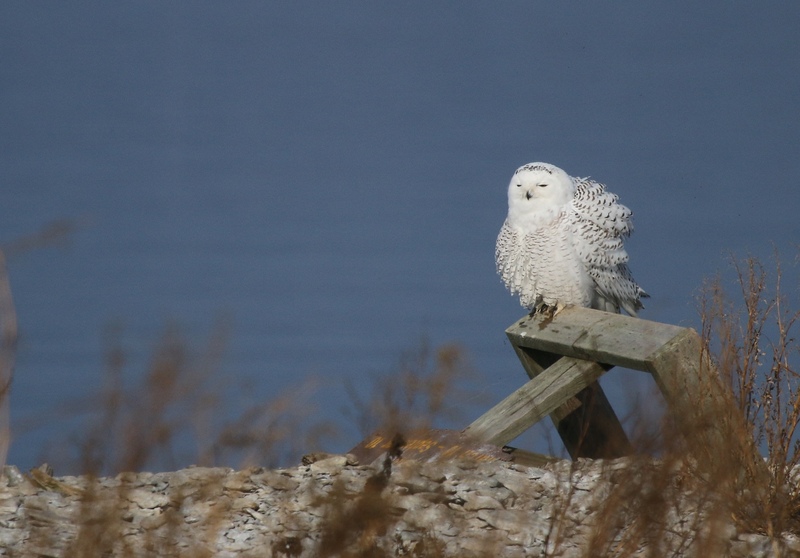 It was an absolutely beautiful morning, and the white owls against the blue sky and blue lake looked stunning. This one flew off to have a bath in the lake. 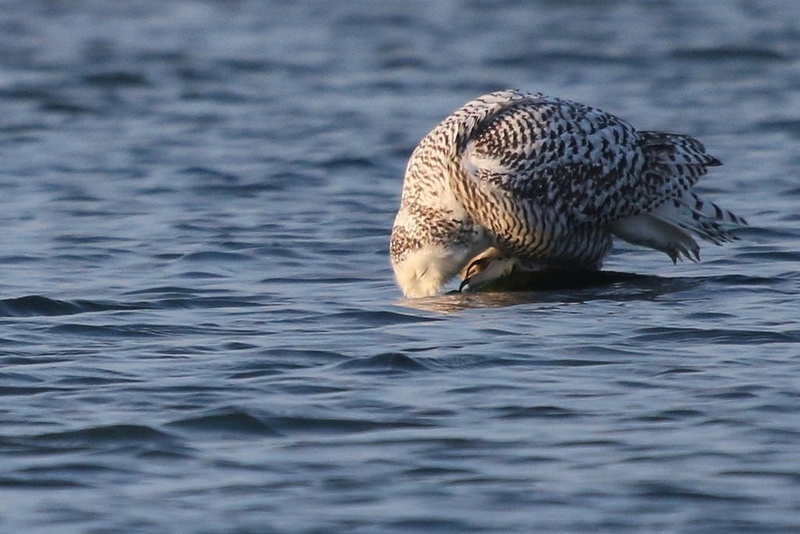 It came straight up from the shore and begin to shake and preen its wet feathers. 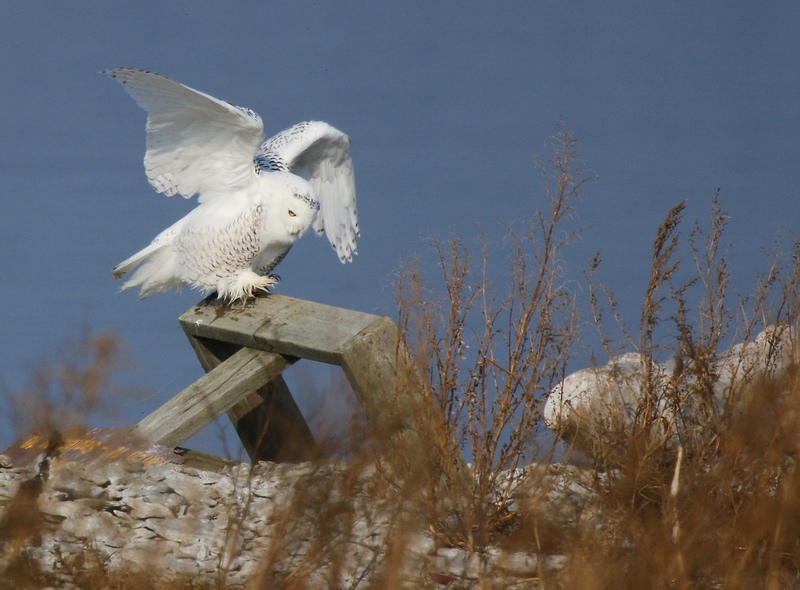 What a privilege to see these beautiful birds from the arctic. This must have been one of my all time best mornings photographing wildlife. 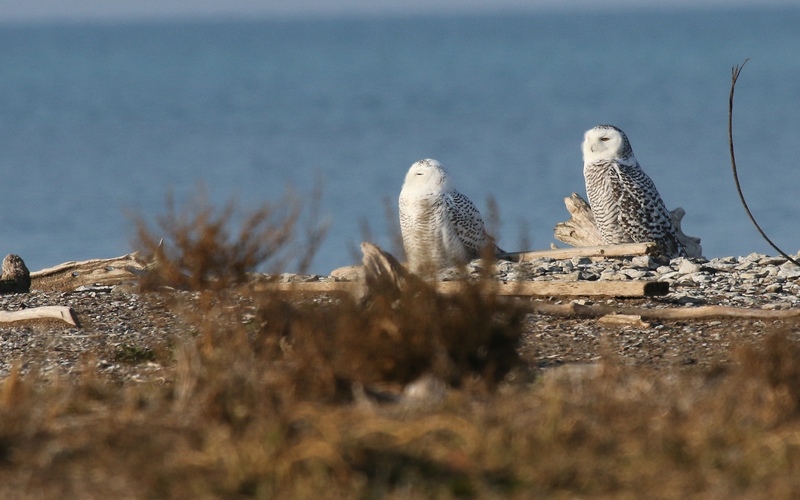 I don’t know if these snowies will all stick around at Presqu’ile for the winter, but if they do there are plenty of voles and waterfowl for them to feast on. Here’s hoping! Amazing and wonderful to see all these Snowies. 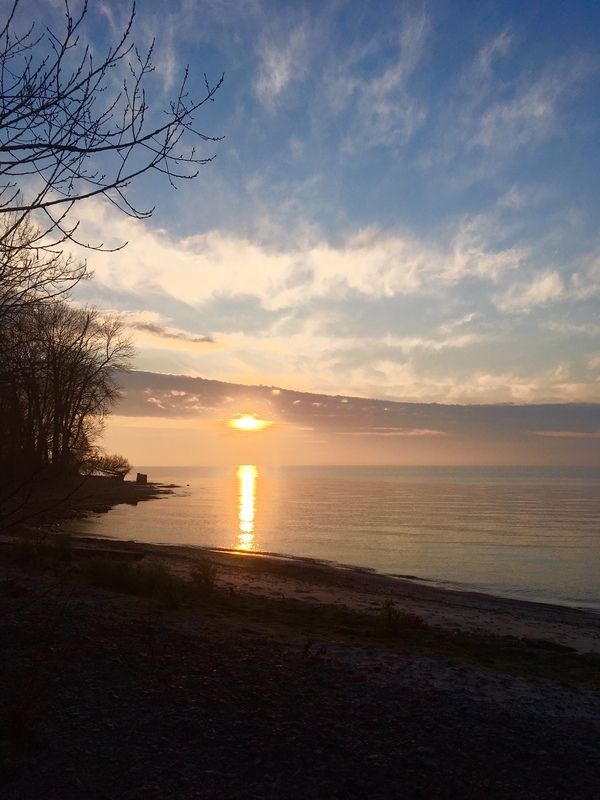 Thankful for your sharing of these beautiful photos and your insights. WOW, WOW I wondered if you may have gone there the Brighton FB sight said there were 8 spotted. These are spectacular Leslie! I can only imagine the thrill! What a great day for you! 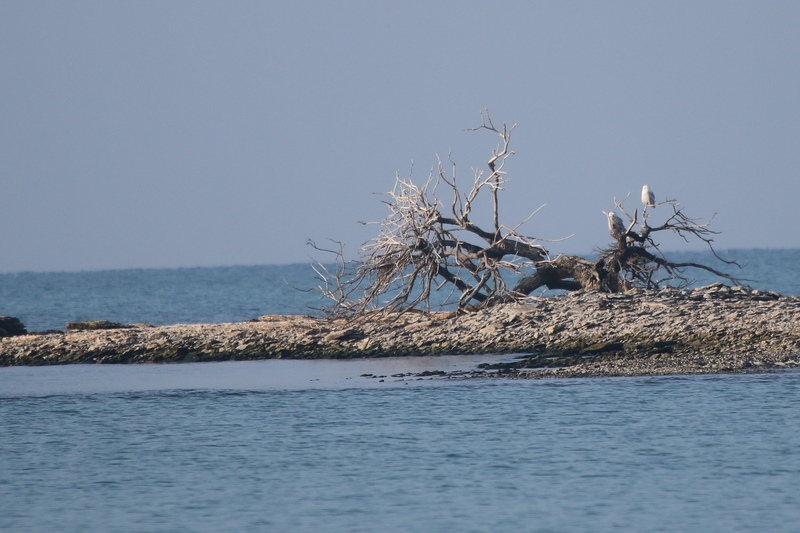 I love going to Gull Island in November, only did it once but well worth the hip waders! 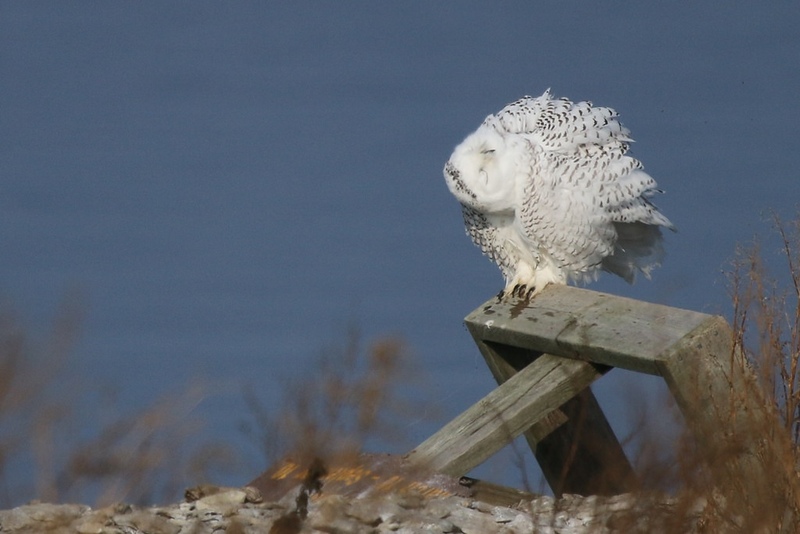 Oh my gosh, this is a truly amazing album of photos of the owls! I could look at these over and over again. Thank you so much for sharing! Wow! Such a beautiful experience. Thank you so much for sharing! What spectacular photos, and what a magical experience! You were indeed in paradise! Wish I had hip waders! What time were you out there? Thanks so much for sharing these, and Audrey for forwarding your link. One question: what type of camera were you using? Hi there I was out at sunrise for a couple of hours. I use a Canon 70D and a 400 mm lens. 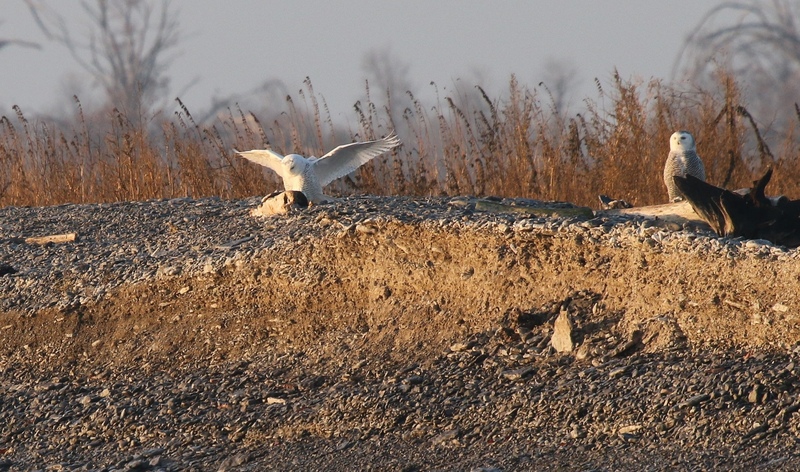 All my photos are heavily cropped as I did not get close to the owls. 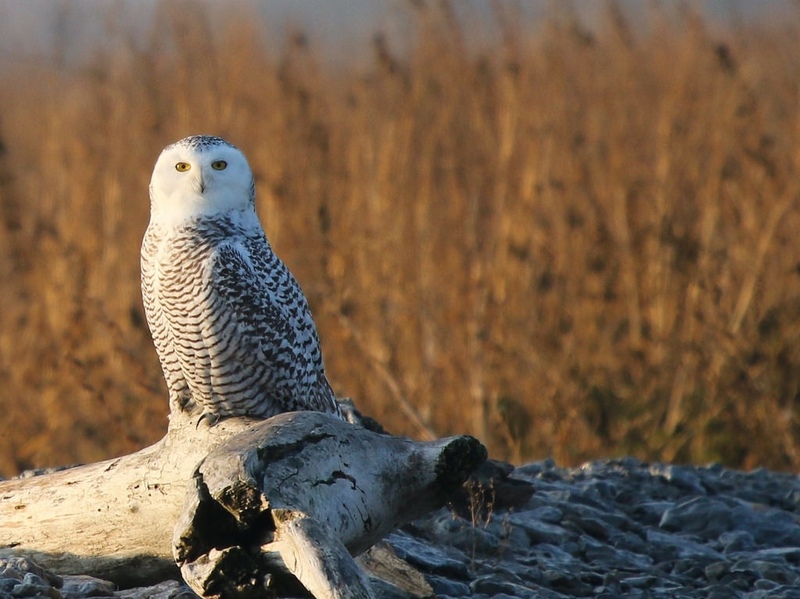 we are lucky to see Snowy Owls here in Metro Vancouver, and it always seems to be the solo acts. what a bonanza to see more and see them doing other activities like bathing and regurgitating pellets! fantastic shots, and a great and informative narrative to go with them! Hi there! 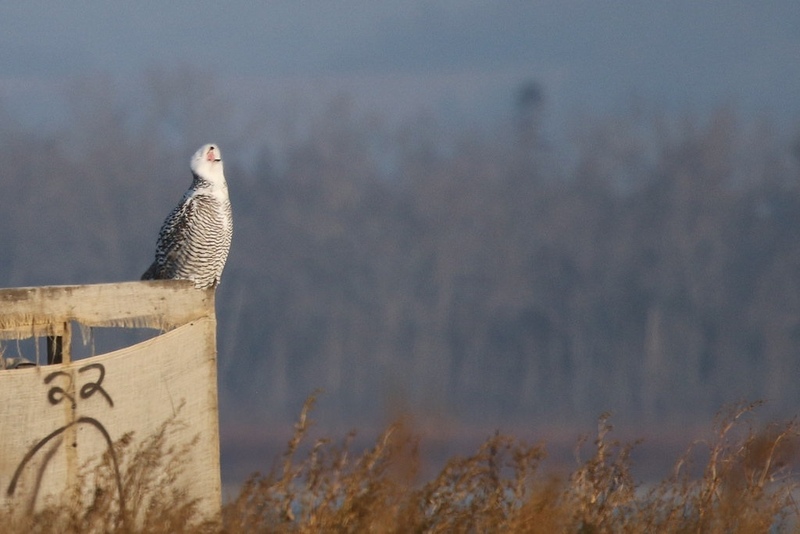 I was in Delta, BC at the bird sanctuary there last April but that is not the right time of year for snowies. Did see more waterfowl than I have ever seen in my life! You really had a great day there, and thank you for sharing. B eautiful. Makes me long to be back in the wilderness. Joyce (your mother’s swim pal). Today, at a friend’s house, I came across an Ontario Wildlife Calendar that features your beautiful photography. She had been gifted this calendar. Are these calendars for sale anywhere in Northumberland County? (We live in Brighton). I would dearly love to purchase two or three. Thank you Gisela, I have written you an email.